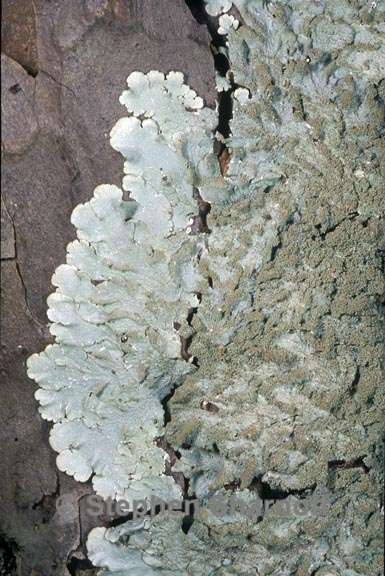 Thallus: adnate, foliose, 4-10 cm in diam., irregularly lobate lobes: subirregular, elongate, plane to subconvex, separate, 2-5 mm wide; apices: rotund, eciliate upper surface: pale gray, smooth to rugose, dull, pruinose at lobe tips and strongly reticulately white maculate, finely cracked, isidiate isidia: common, dense, laminal, cylindrical, simple to coralloid; soredia and pustulae absent medulla: white with continuous algal layer lower surface: black to rarely dark brown; rhizines: sparse to moderately dense (except margin), black, simple Apothecia: rare, laminal on thallus, substipitate, 1-4 mm wide; disc: red brown to dark brown, margin usually isidiate ascospores: ellipsoid, 13-15 x 6-8 micro meter Pycnidia: not seen Spot tests: upper cortex K+ yellow, C-, KC-, P+ yellow; medulla K-, C-, KC+ pale pink, P- Secondary metabolites: upper cortex with atranorin and chloroatranorin; medulla with perlatoic acid (major) and unknown acids (trace). Substrate and ecology: often on pines in montane, open pine-oak woods, rarely on rocks World distribution: pantropics and extending into adjacent temperate areas of SE USA and southern Europe Sonoran distribution: Sinaloa, in the Sierra Madre Occidental. Heiman, K. and J.A. Elix. 1999. A new species of Canoparmelia from North America (lichenized Ascomycotina, Parmeliaceae). Mycotaxon 70: 163-166.